One thing that I keep needing to re-learn, is never to ask myself a question when the answer will not be helpful. Have you ever noticed that the only time you ask yourself the question, “What is wrong with me?” is when you are not feeling good? And what then do we think the answer will be? Something new, uplifting, and helpful? Never. Questions like, “What is wrong, what is missing, why do I feel so ……?”, are ripe opportunities for the egoic mind to jump in and say, “I”ll tell you what is wrong with you! And then it goes crazy with all sorts of worn-out, old, frightening reasons why you are in the wretched state that you are, and why this is your (or someone else’s) fault. And we believe it. It feels like the truth. When I catch myself doing this, I try to ask a better question, like, “What is right about this (or me?). What is right in my life right now?” and then I don’t try to figure it out, I let an answer come. Sometimes just asking the question is enough to lift my spirits and help me start feeling better. It is such a simple and heart-felt prayer: “Show me what is right, show me what is good about my life, right now.” Questions like these have the power to break old patterns of reactive thought since they are invoking the deeper self: the Spirit of Love itself. Ask yourself a new question today….one that doesn’t cause you to cringe and brace yourself for the answer, but that makes you smile in happy anticipation; one you would enjoy hearing the answer to. 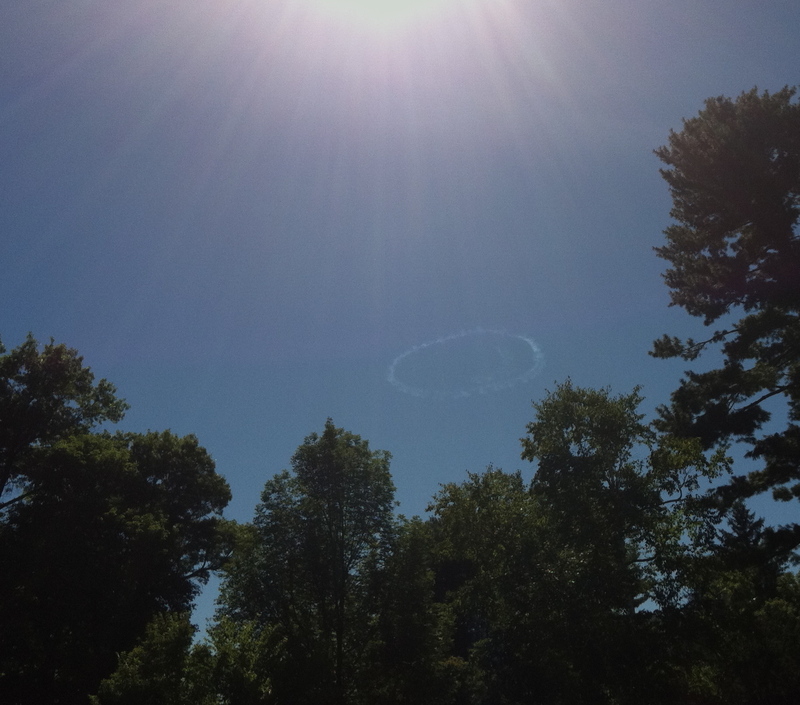 *As a friend and I were walking to our morning watercolor class this past Saturday, I looked up in the sky and saw a plane flying in what appeared to be an arc, and then it began to close and make a circle. We stood there speechless, as it completed the circle and then came back around to make a smile (you can see the outline on the right). “Insanity: doing the same thing over and over again and expecting different results.~ Albert Einstein. Your post this morning made me remember this quote. And of course the voice in our head ( I call it monkey mind) will make us crazy if we allow it. Much like you related, when I catch myself ‘swirling in the ego swill’, I usually laugh out loud and hit the reset button. Then it’s just fun to watch other people wonder what I’m laughing at! Smile on…..in the sky or wherever you find yourself. Thanks, Mary.